At the beginning of a school year or a new class I like to make these and hang them up near the door. 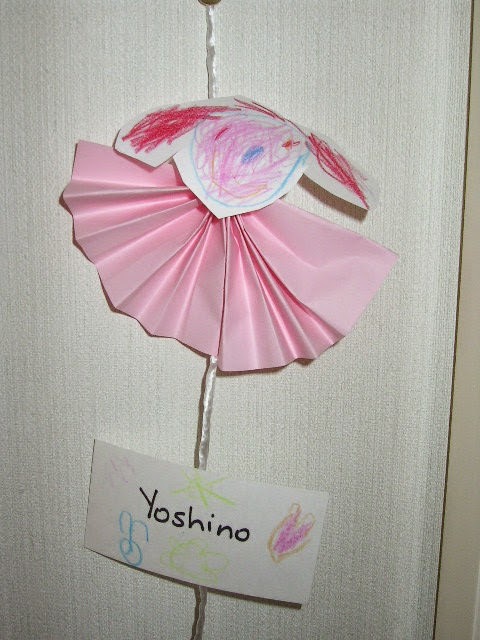 I first made these when I was teaching in Japan and the kids loved to see 'themselves' up on the wall. It is very easy and you only need paper and string. You need an A5 piece of paper to make a folded fan. Fold the paper in half and staple, to keep both sides of the fans together. Children then draw their own face and cut out. You may want to use a photo instead. Use sticky tape to attach this to the back of the fan. Write their names or have them write their name. Attach both the fan and the name tag to a string. I like this idea, it's cute! I think it's really cool that you're a teacher in Japan. I'd actually planned a trip to Japan this summer, but we have to prospone it to probably next year, too bad!